Today I want to share with you a layout I made about my children and their bath time. As I have been cleaning and purging, I found these awesome die cuts from about eight years ago by Frame Ups. And in the spirit of use it up, I pulled them out to use right away. So I looked through my photos and found these gems. I dry fit the layout trying out different options until I found one that worked. So I mounted the pictures on white or yellow cardstock except for the one of my daughter. There was a frame in the set that worked well for this picture to highlight her beautiful face. 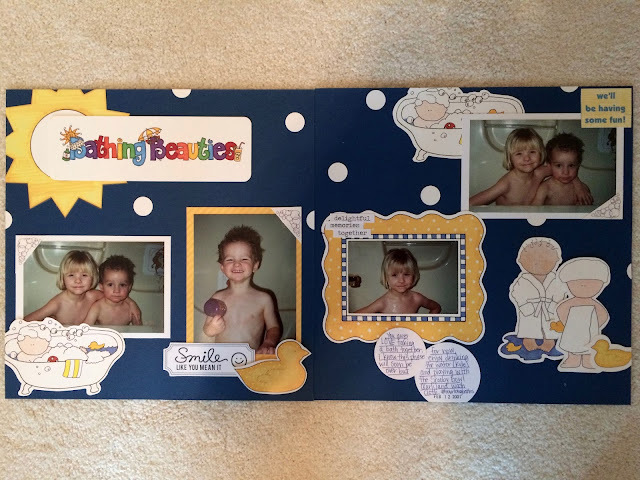 I put pop dots on the Bathing Beauties title, the duck on the left page, the head wrap person and the small duck on the right page to give the page some dimension, and as I looked at the page, I realized I needed a little something else. So I added the punched white dots to resemble bubbles. I also found the word strips "we'll be having some fun" in my stash for the beach but they fit great in this layout. I think they are by TPC Studios. The last step was to die cut two circles and add my journaling. Tomorrow I am going to share my Week in the Life pictures for Monday.